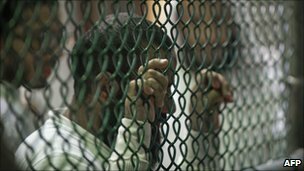 Files obtained by the website Wikileaks have revealed that the US believed many of those held at Guantanamo Bay were innocent or only low-level operatives. The files, published in US and European newspapers, are assessments of all 780 people ever held at the facility. They show that about 220 were classed as dangerous terrorists, but 150 were innocent Afghans and Pakistanis. The Pentagon said the files' release could damage anti-terrorism efforts. The latest documents have been published on Wikileaks,the Guardian, the New York Times and in other newspapers, although it was not clear whether the papers had co-operated with Wikileaks in their release. The Times said they received the files through "another source". The Detainee Assessment Briefs (DABs) also give details of alleged plots, revealed under interrogation, against US and European targets. They included unverified claims that al-Qaeda had hidden a nuclear weapon in Europe for detonation should Osama Bin laden be captured. Other alleged plots include plans to put cyanide into the air conditioning systems of US public buildings and attempts by al-Qaeda to recruit workers at London's Heathrow Airport. But the files give little information on the allegations of harsh treatment and interrogation techniques at the camp. The BBC's Jonny Dymond in Washington says many of the details have been heard before in various forms, but never from an official US source. There are now just under 180 detainees at the US naval base in Cuba. Most are deemed to pose a high risk threat to the US if released without adequate supervision. But the files show that US military analysts considered only 220 of those ever detained at Guantanamo to be dangerous extremists. They include Khalid Sheikh Mohammed, the alleged mastermind of the 9/11 attacks on the US, and Abd al-Rahim al-Nashiri, a Saudi accused of planning the 2000 bombing of the destroyer USS Cole in Yemen. Another 380 detainees were deemed to be low-ranking guerrillas. At least 150 people were revealed to be innocent Afghans or Pakistanis - including drivers, farmers and chefs - rounded up during intelligence gathering operations in the aftermath of 9/11. The detainees were then held for years owing to mistaken identity or because they were in the wrong place at the wrong time, the memos say. In many cases, US commanders concluded there was "no reason recorded for transfer". Mukhibullo Abdukarimovich Umarov, a Tajik man, was arrested in Karachi in 2002 and spent almost two years at Guantanamo before being released - his assessment says the reasons for detaining him were "undetermined"
Naqib Ullah, aged about 14 when he was arrested, spent a year in Guantanamo but his file states he had been kidnapped by the Taliban and presented no threat to the US. The Pentagon "strongly" condemned the leak, calling it "unfortunate". It described the assessments as snapshots that may now be outdated and said reviews of all inmates in 2009 had in many cases reached different conclusions to those in the DABs. Is Manning being punished before trial? "Both the previous and the current Administrations have made every effort to act with the utmost care and diligence in transferring detainees from Guantanamo," said the statement. "Both Administrations have made the protection of American citizens the top priority and we are concerned that the disclosure of these documents could be damaging to those efforts." The 779 documents were part of a cache of tens of thousands of secret US military files leaked to Wikileaks last year. 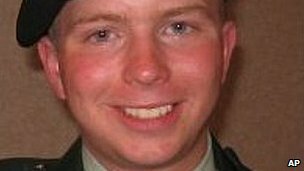 Bradley Manning - the US soldier accused of being behind the leaks - was arrested in May last year and is currently detained at a military prison in Kansas pending a court martial. The founder of Wikileaks, Julian Assange, is battling extradition from the UK to Sweden, where he is wanted over allegations of sexual assault. His supporters say the case is politically motivated. 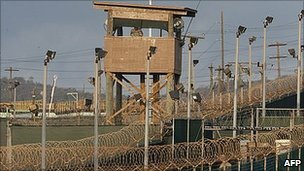 The Guantanamo Bay detention facility was set up in 2001 under the Bush administration - President Obama pledged in January 2009 to close it within a year. However, in March this year he announced he was lifting a two-year freeze on new military trials for detainees there. The White House says Mr Obama remains committed to the eventual closure of Guantanamo Bay. The US soldier jailed for leaking thousands of classified documents to Wikileaks came from a military background, but became frustrated with her career. At least one person is killed and several others are injured after a tornado roared through the city of Tulsa in the US state of Oklahoma.